Considering the recent volatility of the stock market, the findings of a recent report from the Federal Reserve Bank of San Francisco are particularly apropos. The exhaustive study gives real estate the edge over stocks when it comes to long-term investment performance. 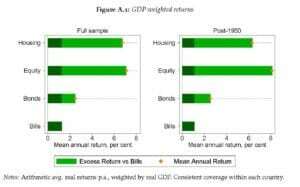 What is the aggregate real rate of return in the economy? Is it higher than the growth rate of the economy and, if so, by how much? Is there a tendency for returns to fall in the long-run? Which particular assets have the highest long-run returns? Conventional wisdom has held that over the long term, stocks are the best place to put your money. This study, Ippolito notes, found that both real estate and the stock market performed admirably well over the 145-year period. Particularly interesting is that residential real estate beat stocks while being less volatile and risky. The study only looked at residential properties, so it is premature to conclude the same trends would hold for commercial properties like office, retail, apartments, hotels, self-storage, etc., which are included in most diversified real estate portfolios. Also, performance numbers were based on cash purchases of the real estate, rather than any that involved leverage. And a holding period of 10 years was applied in the study, while the average crowdfunded/syndication runs closer to 5. We share Ippolito’s wish for a followup report that takes a deeper dive to explore the broader picture. In the meantime, we urge you to check out his blog post for more insights.